I agree the draft has been mostly solid from our front office. The issue has been drafting and developing top tier pro-bowl impact talent. The fallout of missing on RGIII AND giving up those picks hurt us double time. Then the following drafts have hit on mostly solid starters and good depth but lacking the signature dominant player. I agree with how the team currently operates a more aggressive approach in FA would be welcomed. With all that being said I'm most interested in this upcoming season. The combination of the last three drafts and the strength of our position coaches give me hope in development. I agree the draft has been mostly solid from our front office. The issue has been drafting and developing top tier pro-bowl impact talent. The fallout of missing on RGIII AND giving up those picks hurt us double time. I know there's been talk of the Redskins increasing their use of the RPO this upcoming season. Here's a video I thought was really interesting in terms of the thinking and concepts that go into it designing these plays... even if it is nauseating to watch 9 minutes of an Eagles love-fest. 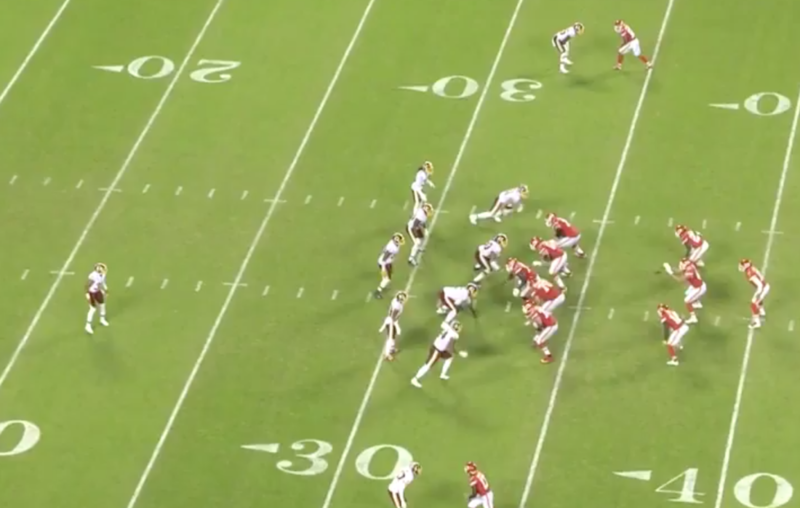 Brett breaks the RPO down extremely well in this video too... including how to stop it, which gives a hint into why we may have felt forced to reach on Payne (if you consider it a reach). The fact that you ask why means to me you decided to ignore the reasons provided - that I articulated about as clear as I can and that others have also stated. So the only thing I can assume is you really don't want to know why. You prefer to continue to look at this trade in a vacuum - which BTW I have stated many times, including the post you quoted - that in a vacuum the trade is not that bad. But since you refuted the 3 pts I will address your responses. Compensation picks start at the end of the 3rd rd. So that first comp pick is at 97. Until they had compensation picks that was the first pick in the 4th rd. Just because they artificially inserted them at the end of the 3rd rd and call them 3rd picks does not change that they start at 97. But that was not really the point as I get 96 or 97 or 99, not that much different. Which is really the bigger point. Once you get outside the first 100 picks your chances of finding a solid player gets exponentially hard. The 3rd rd pick they gave up was pick number 78 - a full 19 picks sooner. That is a big difference. Your response to point 2 continues to ignore the fact that if you don't trade the pick away, you can still trade down with the same 2nd rd pick and now you have two - which was and still is the main point. They used completely independent resources to get the pick for Christian at 74, meaning they could have had both 74 and 78. People keep trying to act like trading away that 3rd pick is a wash or even. It's not. Also, the draft is a numbers thing. The more picks you have the better your chances of hitting on great players. Therefore 2 3rd rd picks are > than 1 3rd rd pick. Point 3 again still continues to miss the bigger point that the QB debacle by Bruce and company is not limited to Fuller and the 3rd pick. It's the loss of Kirk without being prepared for that eventuality and getting something of value out of a NFL starting QB - I don't know like maybe a 3rd pick and starting slot corner from another team - just to provide one example. This should really be a total offense stat, not just a focus on QB, but still pretty interesting. Lol Eli. ESPN just came out with their annual off-season grades for each team. Washington botched the Kirk Cousins negotiations years ago. That won't count against them here. They recovered admirably by acquiring Alex Smith from the Chiefs. "Kansas City got a good young corner [Kendall Fuller] and a third-round pick that turned into a guy named Malik Jefferson [selected by Cincinnati after another trade]," an exec said of the Smith trade. "Washington would make that trade every day of the week for a starting quarterback who is everything you want as a leader and is showing no signs of slowing down." Cousins or Smith? There is some debate over which one is better, which suggests they're roughly comparable. But through the nature of their contracts, only one of them -- Cousins -- will be seen as a disappointment if he fails to reach the Super Bowl with his new team. "You are talking about grizzled Alex Smith with 15,000 different coordinators, actually getting better as his career goes on," an exec said. "Washington gets a better leader. Do they get a better player? I think that is strong enough to nudge him to being a better player. He is not a Hall of Famer, but like Kurt Warner, he can be good at 35, 36." The Vikings finally stabilized their quarterback situation for the long term. The three-year, $84 million price paid for Kirk Cousins makes them a fascinating case study. "They went out and said, 'We've talked ourselves through the professional tape and Kirk Cousins makes more throws in more situations than Case Keenum, so he is going to give us that little nudge we need to win those games when the defense is not at its best,'" an exec said. "I believe he is capable of doing that. The rest is fit, and I'm not going to get into whether he's aloof and what his teammates think of him and whether that is why [Redskins president] Bruce Allen didn't like him and called him 'Kurt' during his press conferences." The difference between the price for Cousins and what former starter Case Keenum is getting from Denver is about what it would have taken to keep running back Jerick McKinnon, but he never seemed to be a priority. Meanwhile, the Vikings have already re-signed linebacker Eric Kendricks. "They still have Anthony Barr, Danielle Hunter and Stefon Diggs to pay, and then with Kirk, he is a good player, but he simply cannot finish games consistently," an exec said. "He was not a finisher at Michigan State and he is not a finisher in the league." Is that really true? Since 2015, Cousins trails only Andrew Luck, Russell Wilson and Tom Brady in QBR during the final 7:30 of games when his team trailed by as many as eight points. There's still a perception that Cousins implodes at the most critical junctures. However, two other execs said they would have done what the Vikings did, albeit with some reservations. "Not that I think Kirk Cousins is worth all that money, but in terms of upgrading the quarterback position, keeping their team intact and starting to extend their own guys, they did well," one of these execs said. "They re-signed Kendricks and now they are working on the other three guys. I think they can pull it off. They've got the cap room over the next few years. They could always pick two of the three guys to extend and trade the other one." The Eagles lost their offensive coordinator and quarterbacks coach after shredding New England's defense in the Super Bowl. They traded away their 2018 first-round pick in a deal that netted Baltimore's 2019 second-rounder. They acquired defensive lineman Michael Bennett and cornerback Daryl Worley, only to release Worley following his arrest on charges that included DUI (they kept Bennett after he surrendered on a felony assault charge and denied wrongdoing). "Do you think the locker room is better than last year, the same or has gotten worse?" an evaluator asked. The implication was that adding outsiders such as Bennett and Mike Wallace while subtracting past contributors such as Vinny Curry, Mychal Kendricks and Brent Celek could throw off whatever it was that helped the Eagles claim their first victory in a Super Bowl. But does a Super Bowl champ ever return intact? Personnel challenges almost always await. "They are trying to be a little bit like New England, tapping the last out of Bennett, the last out of [Haloti] Ngata," an exec said. "You can understand why they got rid of guys on a case-by-case basis, but collectively, I might have wanted to keep the group together another year." The Cowboys joined the Bears and Chiefs in the bidding for wide receiver Sammy Watkins. While some execs criticized the price Kansas City paid, I got the feeling they would have felt better about Dallas' offseason more positively had the Cowboys been the ones to close the deal -- especially after tight end Jason Witten retired and top receiver Dez Bryant was released. "I probably would feel better about Dallas' offseason if they got Watkins, to be honest with you," an exec said, "just because when you've got those young quarterbacks, you'd better try to get them some kind of weapons. Allen Hurns to me is a big slot receiver. He is almost like a tight end. Losing Witten was painful -- just very painful to lose him." Dak Prescott has ranked among the NFL leaders in QBR on third-and-2 or longer, a proxy for obvious passing situations. Witten was on the field for every one of these plays over the past two seasons. Overall, Prescott ranked fourth in QBR last season, but you'd never know it from watching the Cowboys' offense when Ezekiel Elliott and/or Tyron Smith were unavailable. "Prescott takes a lot of guff, but his receivers aren't that good," an evaluator said. "Allen Hurns will not be as good as Dez Bryant. He is just cheaper and a name because he caught 60 balls three years ago. He is beat up. He was a slow college free agent, then he got hurt and he's not getting faster." What would you do if you held the second pick in the 2018 draft, but did not like the quarterbacks available better than the ones already on your roster? Would you select one of the quarterbacks anyway, in the name of positional value? Perhaps you would have taken the top pass-rusher, Bradley Chubb. The Giants went with running back Saquon Barkley, and heard about it from critics who thought the team missed a golden opportunity to find Eli Manning's successor. "I actually think they like Davis Webb quite a bit," an exec said, "and they probably weren't sold on the top four quarterbacks. So they said, 'Let's try to win now, and let this kid [Webb] try to develop and see if we are right about him.'" The danger is that the Giants might be bad enough in 2018 to miss the playoffs but good enough to miss out on a 2019 draft choice early enough to target a quarterback. That would be problematic if Webb or 2018 fourth-rounder Kyle Lauletta are not viable replacement options for Manning. The Giants are one of three teams, along with Pittsburgh and Cleveland, to select a quarterback in the first four rounds in each of the past two drafts. Hall of Fame GM Ron Wolf, famous for repeatedly drafting quarterbacks in Green Bay even when the team was set with Brett Favre as its starter, selected only one passer in the first four rounds (Aaron Brooks, 1999) during his 10 drafts with the team. "Yeah, but the Giants don't have Brett Favre, they have Eli Manning," an exec countered. "How are you going to be able to get a quarterback in the future? I think if they had engaged the Jets and gotten the three second-round picks to move down, that would have been the smarter move rather than drafting Barkley. I don't know if that was an option, but imagine instead of getting Barkley, they end up with Quenton Nelson, Nick Chubb and John Hernandez. I would trade Saquon Barkley right now for Nelson, [Nick] Chubb and a second." The Giants' grade suffered further based on their decision to make Nate Solder the highest-paid offensive lineman in the league. Yes, they needed a left tackle. Is Solder above average? There were also questions over whether Pat Shurmur was better suited as a coordinator than as a head coach. QB1 is no longer here. Intriguing stat. I wonder - how many rushing touchdowns did the Chiefs have in the red zone vs. us over that same time frame? I honestly don't know, but I think it may also be a relevant stat. It would also be interesting to know how many trips in the RZ this is based upon too. Raw numbers don't help. We need RZ efficiency (which still might favor QB1 but would be more telling). I think it is worth pointing out QB1 played on a team that couldn't score a rushing touchdown in the red zone if their lives depended on it. Amen. I don't know about Alex with the Chiefs but the Skins couldn't run near the end zone and opponents linebackers played off the line to stop the pass so slants were useless near the end zone. I hope they don't use the RPO and get Smith hurt. If he gets hurt running the RPO I'm going to lose it. Near identical last year between Skins & Chiefs. 214 for the Chiefs, 247 for the Skins. One thing that should be fun with Alex is some funky formations that will remind us a little of 2012 but should help the run game. Especially now that they have Guice. Guice, Thompson and a receiver/TE in the backfield at the same time where Alex himself is a threat to do a keeper.